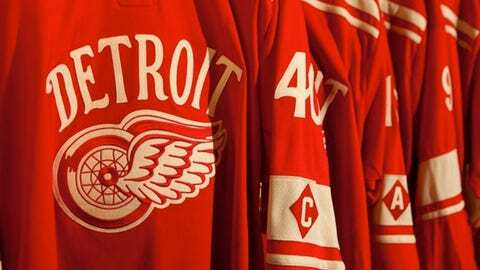 After the Red Wings' 5-4 shootout victory in Toronto Dec. 21, the all-time record stands at 276-276-93. As two of the Original Six teams, the Detroit Red Wings and Toronto Maple Leafs have a storied rivalry, just not a rabid one — yet. Until this season, it’s a rivalry that their fans have rarely enjoyed as the Wings were relegated to the Western Conference and the Leafs played in the Eastern Conference. That changed this season as the Wings moved to the East, joining the Leafs in the Atlantic Division. What better way to celebrate the rekindling of the rivalry than with a potential record-setting game at Michigan Stadium in the 2014 edition of the Winter Classic January 1st? Aside from their meetings with the Chicago Blackhawks, the Wings have played the Leafs the most in history. After their 5-4 shootout victory in Toronto Dec. 21, the all-time record stands at 276-276-93. The two teams are close in the standings as well, with 45 points apiece through Sunday’s games. The Wings are 18-13-9 in 40 games while the Leafs are 20-16-5 in 41 games. The Wings have battled injuries most of the season but they are starting to get healthier as the Winter Classic approaches. Captain Henrik Zetterberg returned to the lineup Saturday in Florida after missing 11 games with a herniated disc. Justin Abdelkader returned after missing five games with a concussion. Goaltender Jimmy Howard hopes to play Monday in Nashville after missing eight games with a sprained left medial collateral ligament (MCL). "It’s one of those things where I still don’t know," Howard told Mlive.com after practice Sunday. "(Saturday) I didn’t really feel it, and then (Sunday) in a couple of movements, I did (feel soreness in the knee). We’re going to make a phone call to Dr. (Doug) Plagens (team physician) and see if there’s any risk." Darren Helm, who has missed 11 games with a sprained left shoulder, is on track to return against Nashville, general manager Ken Holland told Mlive.com. "It was a good day (Sunday), I moved in the right direction," Helm told Mlive.com. "Hopefully (Monday) it feels the same way, or better." Those who definitely won’t play in the Winter Classic are Johan Franzen, who is still experiencing concussion symptoms, Stephen Weiss, who is recovering from sports hernia surgery and Jonathan Ericsson, who is out 3-5 weeks with broken ribs. Both the Red Wings and Maple Leafs have gotten HBO’s star treatment on "24/7 Red Wings/Maple Leafs: Road to the Winter Classic." Aside from the requisite swearing, it seems not too many people are finding excitement in this season’s edition of the show. "My initial diagnosis of this season is that the show suffers from when there’s no connection between the teams we care about, i.e. Sidney vs. Ovi or the decades-long rivalry between the Flyers and Rangers," opined Yahoo!’s Greg Wyshynski. "Watching two teams that don’t care about each other crap the bed for three hours is not the sturdiest foundation on which to build a ’24/7′ season." Although there’s not a lot of animosity yet, the Wings and Leafs could create some more now that they will be playing each other more often. "We can get started," Wings coach Mike Babcock told the Detroit News. "We haven’t had a rivalry since I’ve been here for nine years. There’s no rivalry because we never played against each other. But they have a real team there." With the playoff format changes, perhaps the Wings and Leafs could add a little to the rivalry if they meet for postseason play. "I feel like hate is built through an incident or playoffs," Wings forward Daniel Cleary told the News. "We haven’t even played these guys in years. It doesn’t work like that (instant rivalry). It’s built over time and through playoffs. That drives rivalries." The Winter Classic won’t carry the same intensity as the playoffs but the game will still count in the standings and is expected to have 100,000-plus in attendance.